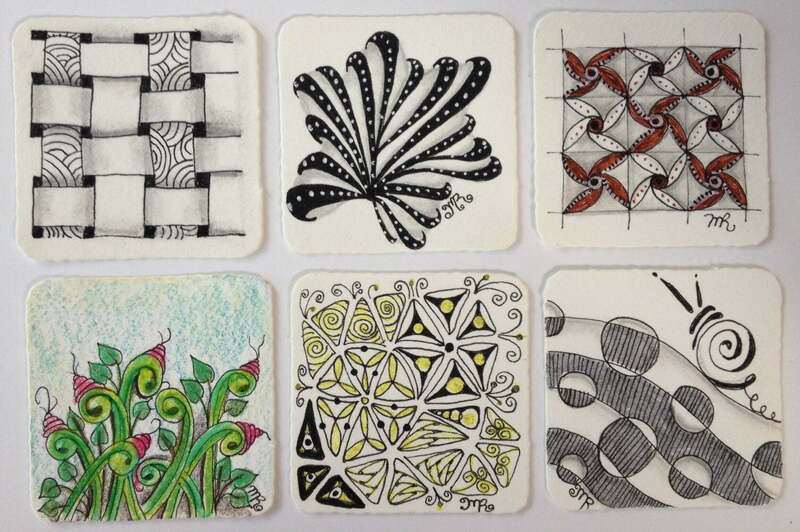 Zentangle Weekly Challenge #179 - Minette Riordan, Ph.D.
One of the most exciting features shared at Certified Zentangle Teacher Seminar #14 was the release of Bijou and Bijou tiles from Zentangle®. Check out this awesome video introducing the world to this adorable snail and his philosophy on tangling. Above, you can see a few of the Bijoux tiles I tangled this week while on vacation with my family in Colorado. Laura Harms of IamtheDivaCZT invited us all to be like Bijou this week. I have found that I love creating monotangles on these small tiles. I also love my new gold, sparkly Gelly Roll Pen from Sakura. Below you can see another video of Bijou and his new tiles. Fun stuff! For those of you who are intimidated by the larger size Zentangle® tiles or are just getting started, this can be a great way to begin your tangling journey. Interested in learning more about the Zentangle method? You can read my post on What is Zentangle? or feel free to contact me about private classes. I teach in person as well as through Skype! You can email me at minette_at_minetteriordan.com. Lots of great work. I like your Aquafleur and Tripoli tiles the best. Thanks, Donald, the aquafleur was my favorite too. I really love all your little Bijoux! The one with tripoli keeps catching my eye, I love that little bit of yellow in it. I had fun with the Tripoli and adding the gold shiny Gellyroll pen to it! Thanks Anoeska! Your Bijou tiles are great! I love the Aquafluer, and your Well tiles especially! Thanks, Kate. Well is definitely a new favorite of mine! wow! you’ve been so busy! i love that aquafleur and the one with springkles – so pretty! Thanks, Alice. I love how quickly I can complete the Bijoux tiles. Very beautiful and very many! Thanks Annemarie, these are so fun to do. All your Bijou tiles are beautiful! Especially I like this with Tripoli! Thank you so much Lonetta! Such lovely tiles. I especially like the green one.